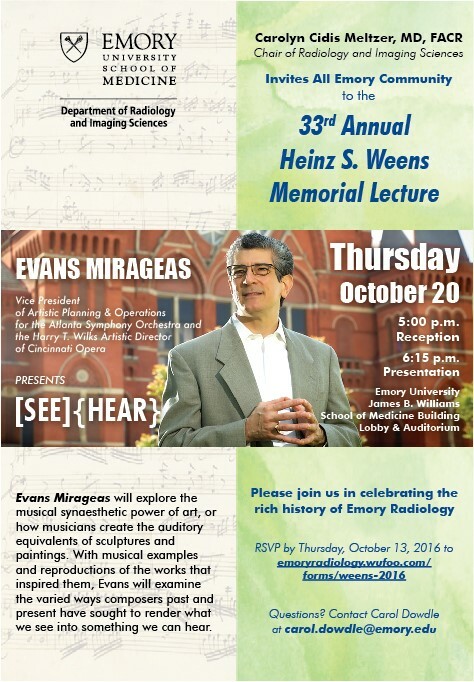 Evans Mirageas will deliver the 33rd Annual Heinz S. Weens Lecture on Thursday, October 20th. His talk, See/Hear, explores the musical synaesthetic power of art, or how musicians create the auditory equivalents of sculptures and paintings. With musical examples and reproductions of the works that inspired them, Evans will examine the varied ways composers past and present have sought to render what we see into something we can hear. 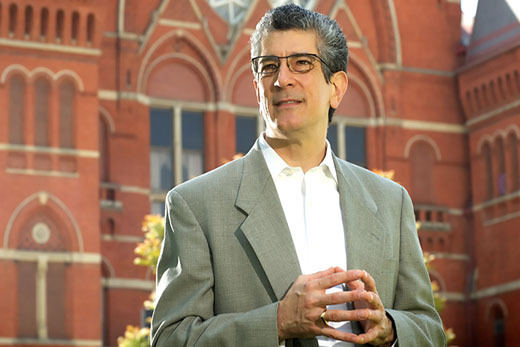 Evans Mirageas is the vice president for artistic planning and operations of the Atlanta Symphony Orchestra and the Harry T. Wilks Artistic Director of the Cincinnati Opera. The evening begins with an hors d’oeuvres reception at 5:00 p.m. in the School of Medicine lobby followed by the lecture at 6:15 p.m. in the auditorium. The event is free and open to all members of the Emory Community - faculty, trainees, staff, alumni and their family and friends. The Annual Heinz S. Weens Lecture is held each fall in memory of Dr. Heinz S. Weens, the first chairman of the Department of Radiology and a pioneer in the field of radiology. Dr. Weens was an innovative researcher, engaged physician and inspiring mentor who embodied the department’s tripartite mission of clinical care, education, and research. RSVP by Thursday, October 13: https://emoryradiology.wufoo.com/forms/weens-2016/.